This boat will really go in the water, pushed briefly by the rubber band paddles, and coasting for a bit of time. The superstructure is up to the imagination of each child. This is a project that requires adult assistance and supervision. (Parental Assistance and Supervision Required) Use wood 3/4 inch thick for the hull, and make sure the grain of the wood runs lengthwise, or the small pieces at the back will crack off. 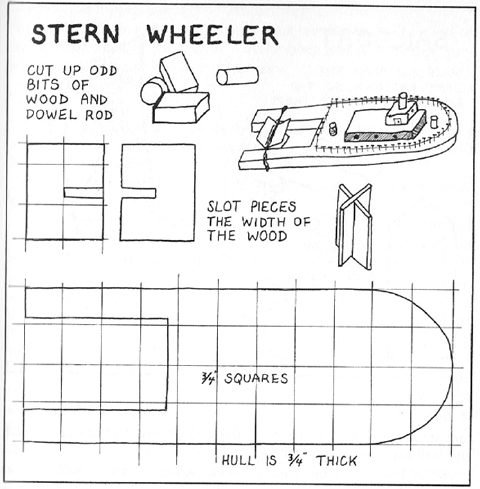 When making the stern wheeler with younger children, saw the hulls beforehand. Older children can use a cardboard pattern and coping saw, and then the wood is prepared for them by cutting only the outside dimensions. Use a sandblock and garnet paper to smooth the hull. Use 1/4 -inch-thick wood for the paddles. Cut these out ahead of time, unless you are working with skilled, older children who can be accurate. Crayon or lacquer the assembled paddle wheel for waterproofing. The superstructure—small blocks of wood and dowel sections for cabins, wheelhouse, and stacks—can be glued or nailed. Children will prefer nailing. Nails can be pounded halfway into 'the hull and strung with thin string, to look like a railing. Crayon or lacquer the hull also, to make it waterproof. If the boat is to be used in open water, fasten a nail with a string to the rear or front, so it won't be lost.